October–November 2017 marks the 100th anniversary of the Bolshevik coup d’etat that brought communism to power in Russia. The roots of this momentous event are traceable to Russia’s entry into the First World War and, more immediately, to the March 1917 revolution that ended more than 300 years of Romanov rule. 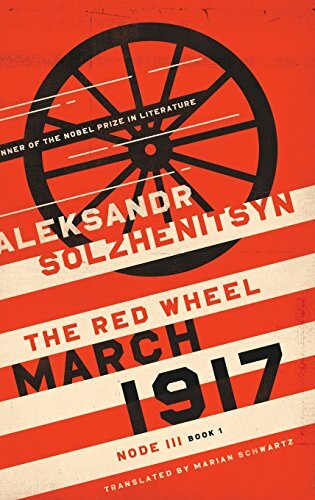 March 1917 is the third “node” of the famed Russian writer and former Soviet dissident Aleksandr Solzhenitsyn’s epic examination of the pivotal events leading up to the Bolshevik seizure of power called The Red Wheel, the English translation of which has recently been published by University of Notre Dame Press. Solzhenitsyn died nearly a decade ago, and is most remembered for his three-volume exploration of the brutal and murderous Soviet slave-labor camp system, The Gulag Archipelago. But he considered The Red Wheel the most important of his books. The first node, August 1914, appeared in English in the early 1970s, and was later updated and expanded by Solzhenitsyn. It focused on the pre-war premiership of Pyotr Stolypin and the disastrous (for Russia) Battle of Tannenberg in East Prussia during the last week of August 1914. March 1917 is one of three books that comprise node III, and in 631 pages covers the events from March 8–12, 1917. Tsar Nicholas II’s government was under siege. Russia was losing the war against Germany. Food was often scarce. Solzhenitsyn vividly describes the fall of St. Petersburg, Russia’s capital, street by street, to unruly and largely unorganized rebels. The military and the police mostly refused to shoot the mobs, and some eventually joined the revolution. Several government buildings were raided and set on fire. Meanwhile, the leaders of the Duma—Rodzyanko, Kerensky, Milyukov—maneuvered to assume power if the Tsar’s government did not survive. Bolsheviks and Mensheviks also plotted to seize power. Solzhenitsyn originally planned to extend The Red Wheel to 1922, with the communist victory in the Russian Civil War. Instead, Solzhenitsyn ended his magisterial work in April 1917, after the Romanov dynasty falls but before the Bolshevik coup. Perhaps he just ran out of time. But he told one biographer that ending the story at April 1917 was sufficient because the March revolution was the main event whose outcome determined Russia’s 20th century history. The Red Wheel and The Gulag Archipelago have been called Solzhenitsyn’s two “cathedrals.” You cannot fully understand the horrors of communism and the history of the 20th century without reading them.